Children take part in Day of the Dead festivities at the Hollywood Forever Cemetery in Los Angeles. Photo by Richard Vogel/Associated Press. Death dinners and death cafes offer people space to collectively discuss the physical, psychological, and spiritual aspects of death over a gourmet meal. College courses with names like “Death in Perspective” and “Happiness, Death, and the Meaning of Life” have long waiting lists, and thanatology (the study of death, dying, and bereavement) is a growing academic field. Blogs such as Morbid Anatomy, Death Salon, and the YouTube web series Ask a Mortician have garnered huge followings, helping to birth the Death Positive Movement, which aims to encourage greater individual agency concerning end-of-life care, the dying process, and funerary arrangements. The country’s greater openness towards planning for the inevitable has given rise to new professions such as certified death doulas—mortuary midwives who assist in the dying process—and memorial videographers. Likewise, our entertainment reflects a growing captivation with death, seen in the popularity of TV shows such as ; Forever; Dead Like Me; and The Good Place. All of this marks a distinct cultural shift from avoidance of the topic that distinguished western society in the mid-20th century, outlined by anthropologist Ernest Becker in his 1973 classic, The Denial of Death. But, why have Americans become more open about death in recent decades? My research leads me to believe that Mexican and other Latin American immigrants and their U.S.-born children have had a significant influence on mainstream U.S. attitudes towards death and mourning. One prominent vehicle for this change has been a holiday called El Día de los Muertos (the Day of the Dead), that runs from October 31 through November 2. North Americans initially rejected this tradition from Latin America, but then later adopted it, and embraced it in a way that is profoundly changing the way the United States grieves. Day of the Dead is a celebration where people ritually remember deceased loved ones through traditions such as adorning graves, prayer, altar-making, street processions, music, and preparing special foods. While customs vary from country to country, Latin American cemeteries are abuzz at this time of year with families sprucing up graves, vendors selling festive foods, and itinerant musicians strolling among the tombs to serenade the departed. Unlike the somberness associated with U.S. cemeteries, the emphasis is on happy family reunions between the living and the dead. In the 1970s, Mexican-American artists and educators, inspired by visits to indigenous regions of southern Mexico, introduced elaborate Día de los Muertos altar-making traditions to the U.S. The artists who created Día de los Muertos installations in American museums, schools, universities, libraries, and parks had two aims. First, to celebrate publicly their cultural heritage in a country that had often treated Latin American immigrants and their descendants with disdain. And more broadly, to challenge prevailing attitudes about death by introducing an indigenous worldview in which the deceased are always present among the living and must be ritually remembered. In contrast to the death-averse attitudes common in the U.S., where the dead are seemingly forgotten, Day of the Dead celebrations keep the dead alive. For example, Mexican altars are story-telling mediums that honor the lives of the dead through displaying photos of them along with favorite foods and personal belongings the deceased enjoyed in life. But Day of the Dead altars were originally made in a different context. What had been primarily a religious ritual carried out within families in Latin America was transformed here into a secular, public art form, sometimes with political messages. Many altars are erected in memory of groups of people who may be unknown to the altar maker, as a way to raise awareness about preventable sociopolitical causes of death including domestic violence, unsafe labor conditions, HIV, drugs, or war. Some memorials have left the cemeteries and taken on new forms, including altars made in the trunks of Chicano “low rider” cars and altars dedicated to deceased pets. Moreover, the celebration has moved beyond the Latino community to include participants from diverse backgrounds, says Tere Romo, a longtime curator of Día de los Muertos exhibitions in cities throughout the U.S. “It’s one of the few exhibits that you can walk into a gallery and see a crowd that is totally diverse…African Americans, Asians, Latinos, whites, all ages, moms with their kids, school children, old people and every age in between,” says Romo. 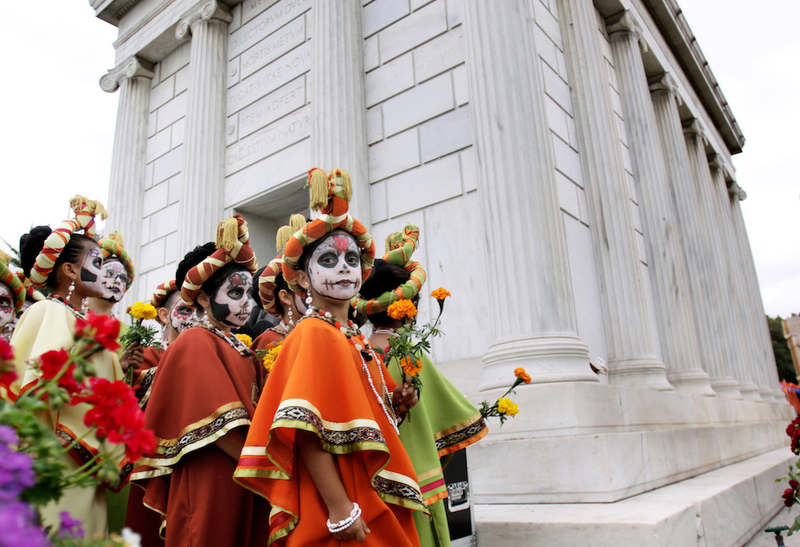 In contrast to the death-averse attitudes common in the US, where the dead are seemingly forgotten, Day of the Dead celebrations keep the dead alive. But as Día de los Muertos celebrations spread across the U.S. in subsequent decades, the initial revulsion gave way to a public embrace of the holiday’s focus on the dead. The colorful celebration was covered in national magazines such as Ladies Home Journal and Better Homes and Gardens and portrayed in books, video games, TV shows and movies, including hits such as Beverly Hills 90210. Recently, the James Bond movie Spectre featured a Day of the Dead procession, and the entire plot of Disney’s huge hit Coco was built around the celebration. In their 1991 magnum opus, Celebrations of Death, U.S. anthropologists Peter Metcalf and Richard Huntington noted that poverty-stricken societies with high mortality rates and low social mobility generally held accepting attitudes towards death. Viewing death as a peaceful, even joyous release from life’s hardships, people in these societies often played active roles in preparing bodies for burial, planning funerals, or engaging in mourning and remembrance rituals. But in societies where greater levels of financial prosperity, geographic mobility and individualism allowed people to distance themselves from their families, people held less accepting attitudes towards death and played only passive roles in mortuary rituals, the authors found. In the U.S., this passivity was enabled by the rise of the corporate funeral industry in the 20th century; most Americans became physically separated from their dead. The deceased were no longer cleaned and dressed by family members. Wakes were no longer held at home. Instead, professional morticians transported corpses to funeral parlors for institutionalized viewing, and active community rituals of leave-taking and remembering were lost. Today, Día de los Muertos celebrations are held in all 50 states. They have become a standard autumn activity for schools and museums, where students and others are encouraged to remember their own mortality and honor the departed through altar-making, crafts, and street processions. The celebration is also used by counselors and social workers to help clients deal with the traumatic loss of a loved one. And public altar-making activities, once considered cultish or superstitious, are now normal. Regina Marchi teaches Media Studies and Latino Studies at Rutgers University. She is the author of Day of the Dead in the USA: The Migration and Transformation of a Cultural Phenomenon and also co-author of Young People and the Future of News: Social Media and the Rise of Connective Journalism. This essay is part of a Zócalo Inquiry, How California’s Immigrants Have Expanded Our Definition of Wellness, published with support from The California Wellness Foundation.